A few clannies have asked me how to find this out, and one suggested I make a thread for it, so here it is lol. Locate your minimap, and in the bottom right corner there should be an icon that looks like a castle. If you hover over it, a tooltip will appear saying it is the "Citadel Information" icon. Click it. In the top middle of the window that appears, there is a button with a golden check box and up arrow on it. It is marked in a yellow box in the picture below. Click it, and you will go to the area for upkeeps, the job list interface. --Yellow: The job list interface button. This is where you will find all the information about upkeeps and upgrades. You will need to enter your bank pin in order to access it. More on that in Step 3. --Red: This is the build tick timer. When it reaches zero, all the caps will reset, and you can begin to collect resources. --Pink: Here is the count for the number of people who have visited the citadel. Only full members of the clan are counted, and we need enough people to visit each week for the upkeeps and upgrades. If the color is green, we're alright. If it's red or yellow, then we need more clannies to show up. --Dark Red: These are the teleport icons that can be used by clan members to travel all over the Citadel. Mousing over one will tell you what the end location is. The one in the top middle goes to the town square where you may feed the avatars. NOTE: Right now the Mining plot teleport icon is broken. Jagex will hopefully fix it soon enough. --Light Blue: An example of the tooltip that appears when mousing over a teleport icon. Now that we're here, I can start explaining the upkeeps. Every week, we need to collect enough resources of all types to keep the plots from degrading; these are called the upkeeps. The list of areas we need them for can be seen by scrolling up and down in the list. If you click on one, you will be shown a picture of the plot's icon along with all the resource requirements. The resource requirements are organized into horizontal bar graphs, and there is one for each resource needed. The icons for the resources are marked in purple below, and from the top are: Logs/Timber, Stone, (Regular) Bars, Precious Bars, Cloth and Rations. As you can see, the bar graphs are divided up into different colors. The green represents the percentage of that resource that we have collected so far for this upkeep. The red symbolizes the percent we still need. 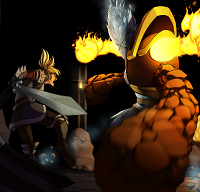 And lastly, the yellow shows what resources we earned from the minions we gather from the Summoning plot. These will fill up any needed resources and act like them at a 1:1 ratio, except with the bars, in which they act as a 3:1 ratio since making bars requires three different resources. More on minions, they will fill up timber first, then slowly move down resource by resource until no more are needed for that upkeep, in which they will move onto the next upkeep or upgrade. Now, the red, as said, represents what resources we need, so to help finish that upkeep, just go to the plot and collect the resources from it. If we need stone, go to the mine, if we need rations, go to the barbeque, etc, etc. It's that simple! And to know how much of that resource we need, just mouse over the icon, and it will tell you. This is marked in light blue in the second picture. Notice how there are no bar graphs for charcoal, (regular) ore nor precious ore? This is because these resources are used to make regular and precious bars, and are not used directly. Also, timber is not needed to make charcoal. Just though I'd clarify that. The wood you see at the furnace plot has nothing to do with the timber plot. --Green: This is the upkeeps tab where you can find all the information about them. --Yellow: Clicking this button will take you back to the screen in step two. --Orange: Beside each upkeep, there will be a percentage saying how close we are to finishing it. If it is red and below 100%, then it still needs work. If it is 100%, but yellow, then that means minions are helping out. This is perfectly fine. If it is 100% and green, then that means we collected every resource for it, and any minions we also collected have been pushed off onto another upkeep or upgrade. --Purple: There are the resource icons, and hovering over them will tell you how many of that resource we have and need. --Blue: The blue here shows how the bar graphs are divided up into different colors. Notice how the yellow minions have been partially pushed off the timber and onto the (regular) bars. Normally they would go to the stone, but we already had all that we needed. --Light Blue: Hovering over the resource icons tells you what resources we have collected, the available ones, the ones from minions from the Summoning plot, the wildcard ones and the amount we still need, the shortfall. --Light Blue: The message you receive when mousing over the icon. If it is there, then that means we need more resources for it. Last but not least, the upgrades. Click the tab with the golden upward arrow. It is marked in a green rectangle in the first picture. The upgrades, as far as what they are, is pretty self explanatory, but just in case you don't know, they are what make our citadel even more epic. By completing them, the very next build tick, we will have a brand new, upgraded version of an item or feature at the citadel. This could be a grand statue, an upgraded skilling plot, new topiary, etc. What's even better about them is that the interface for them acts exactly like the upkeep one with only a couple changes. Again we have the horizontal bar graphs, the green, red, yellow sections and the percentage completes, marked in orange again. One new feature, though, is that there are new blue bars in the graphs. These represents resources that have been collected from last week that have rolled over into this new week as opposed to being used up or left behind. Another change is that with upgrades, we don't need every resource for every single one, unlike with upkeeps. The resources which are not needed are represented with an "N/A", as you can see below. But how do we check what resources we need for these upgrades? The same way we do with upkeeps! Just mouse over the skill icon to have a message appear saying what the shortfall, the red section/the amount of resources we need, is, then go to the matching plot, and start gathering. An example of this is shown in the third picture. Please note, though, that if we have all the resources we need for one type for every upkeep and upgrade, then any extra ones gathered will go to waste. They will not carry over into the next week, unfortunately. Also, we can only ever be working on, at most, three upgrades at a time. --Green: This is the upgrades tab which has all the information about them. --Yellow: Clicking this button will take you back to the window in Step Two. --Orange: The percentage indicated how close we are to completing the upgrade. --Purple: The same skill icons from before, in the same order. --Light Yellow: The "N/A" message which will replace any resources not needed for an upgrade. --Blue: The resource requirement bar graphs featuring blue and red ones. --Light Blue: Mousing over one of the bars will tell you how much of t.
There you have it lol. I hope this helps. If you have any questions about anything, feel free to post them below, and I'll reply to them quickly. Thank you Leo! Awesome work. This will really help us focus on what we need to do to get everything done in a more efficient manner. 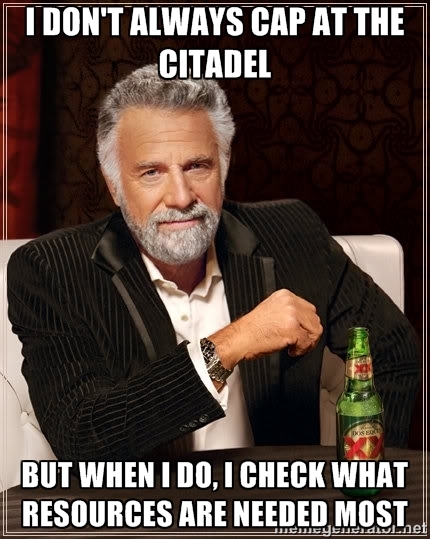 I know when I go to the Citadel I want my work to "count for something". This answers a lot of my questions. Nice tutorial Leo, has this been stickied yet? We need to promote this, so that everyone knows how to view the upkeep and upgrades. To see what all that we need the most. I just witnessed, 1d 15hr, and the upkeep is not finished.. Normally when I enter around this time left til next build tick. The upkeep is fully done. And, I would be cleaning up the scrap ores and getting more charcoal to finish off the scrap ores. Then getting whatever else we need for the upgrades. I believe if we finish all the upgrades, then we can do whatever we please, once we gathered for the upkeep. Just my view point..
(ლ_ლ) I can not look!